As the dust settled following last week's Final Deletion, TNA would look to keep the foot on the gas pedal presenting an Destination X 2016 special of the show. With a major main event with both the World Heavyweight and X Division belts on the line, a major debut and a big return, would the strategy pay off or would TNA careen off the road once again? In the main events conclusion, Mike Bennett would make good on his promise, as he'd attack the referee, causing Lashley and Eddie Edwards title for title bout to go to a no-contest, before he brought out former Ring of Honor stand out, Moose to clean house. Before all the match however, there was an in-ring segment between the two champions, that would start as interview conducted by Jeremy Borash and boil down to an attack from Lashley as he attempted to gain some extra leverage for later on. I'm usually not a fan of these kinds of segments that TNA like to do before a big main event, as they can cause over-exposure for those involved and take away part of the bout attraction later on. However, although I'd have preferred it to take place a week earlier, this bought an extra layer to main event, as Edwards' partner in The Wolves, Davey Richards made his return to the company from injury to save Edwards from a beatdown. Earlier, Lashley had cut a promo that had strong content surrounding Edwards underdog status, but was a little rushed in places. A fairly simple match between Lashley and Edwards, which played out as a power v speed type affair, as Lashley would dominate his smaller his opponent with impact moves like a brutal overhead release belly-to-belly suplex onto the entrance. Edwards offence was mostly kept to hope spots with Lashley always able to get back into the match, surviving a nice tornado DDT reversal and a sitout spinebuster. There was a slip up from Lashley on a top rope spot, that unfortunately saw the two just decide to try to repeat the spot, which wasn't quite worth the wait. That was the exception to the rule however as the wrestling portion of the contest was a great watch and a compelling main event. The sport-entertainment portion started slow with a ref bump as Lashley had the contest won, but exploded in a brilliant false finish as Richards aided Edwards in hitting their Chasing the Wolf finish, before Bennett would make his mark. The debut of Moose genuinelly shocked me as many had thought he was heading to WWE, he looked like a beast here, taking out the Wolves, before a low blow from Bennett allowed him to hit the World Heavyweight Champion with a forearm. There's a lot of possibilities with Moose on board now, the next couple of weeks should be very interesting indeed. In a show that had "The Miracle" all over it, he began the night by attacking DJ Z after "That Yung Go Hard" had became #1 Contender to the X Division title by winning a Ladder match that also included Andrew Everett, Trevor Lee, Braxton Sutter, Rockstar Spud and Mandrews. Let's start with the positives here, this match was as fun as you would expect, with plenty of thrills and spills from the bell as DJ Z and Mandrews nailed Lee and Everrett with dual tope conhilos. There were also some clever moments like Spud biting Sutter's knee (as a call back to Sutter knocking Spud's teeth out last week) to stop him ascending the ladder and Sutter and Mandrews moving two ladders further apart as Lee tried to climb both, before DJ Z hit a front kick to the chicken nuggetts. The closing moments made DJ Z look strong as he fought off all of the Helms Dynasty, including seeing Everrett off the top of a ladder to the outside, en route to claiming victory. A fun and pacy bout, but the third week in a row where we've seen multi-man encounters for either the X Division belt or #1 Contender statues, meaning the division does feel slightly interchangeable and leaving everyone lacking a proper identity. I'll get into Bennett's over-exposure in just a mo. With more batshit crazy segments from Matt Hardy's house airing this week, the Hardy Boyz feud was clearly far from over after The Final Deletion. 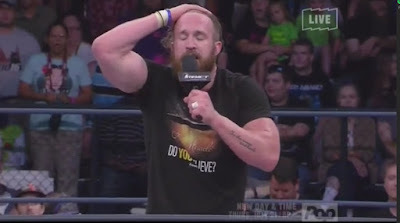 An in-ring segment brought us the core of the story this week with Matt proclaiming he would be making Jeff Hardy his "obsolete mule" Jeff's contract with TNA is apparently been terminated due to the result of last week's bout, so what an "obsolete mule" will involved, I have no idea. Matt was once again marvelous here, with his bizarre broken character continuing to run riot. He worked the crowd perfectly, having them eat out of the palm of his hand, by calling the Final Deletion the greatest match in history and just being generally annoying by shouting "delete" so many times. I'm find him mesmerising to watch at the moment. A few weeks ago I thought this feud had dragged on long enough, but all of a sudden I want more and with a emotional Jeff (now apparently only allowed to be called "Brother Nero") staying silent and calm throughout there's some legs left in this old dog yet. 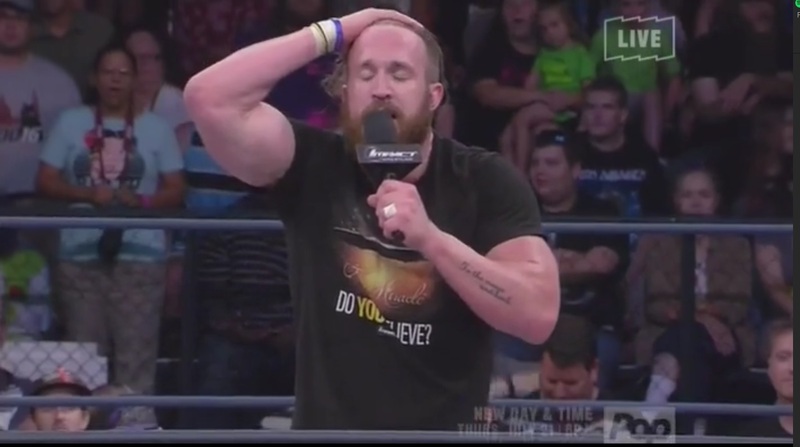 TNA has a problem of giving the audience all their eggs and then chucking the basket at them as well and that was the case as Mike Bennett suffered defeat against DJ Z. Yeah, that's the same Mike Bennett who'd previously been involved in the opening segment and would later be involved in the main event and the same DJ Z who had earlier won a multi-man ladder match. Even for TNA everything was moving way too quick here. The scrap was a solid watch, with similarities to the main event as DJ Z fought from underneath after Bennett berated him throughout the clash. DJ Z's speed was the main focus of the bout as he pulled off a number of quick reversals as hope spots and a beautiful tope conhilo. It was shame that DJ Z didn't look like he'd had a ladder melee earlier in the night, let alone sell the post-match beat-down though. The X-Division guys coming out to foil Bennett's plan of leaving the fight was a cool touch and was an entertaining pay-off to "The Miracle"'s time in the X Division. Sienna would hold onto her Knockout's Championship in a random Four Way, pinning Gail Kim in a conflict that also included Jade and Marti Bell. All three challengers have been prominent on TV recently, but whether anyone deserved a title scuffle was questionable given that all three had lost singles bouts over the last three weeks. Whilst all four women put in effort, the lack of build-up and the presentation, including the commentary, made this match feel completely throwaway. With the correct build this match could have felt huge. It was an easy watch that continued two feuds nicely (Kim & Sienna, Bell & Jade), while the best action came when Jade and Kim went toe to toe again, including a lovely German suplex from Jade. I think the contest would have been better off splitting the heels and faces and doing a tag bout, where extra storylines could be advanced whilst not devaluing the belt further with a thrown together championship clash. The only match on the show that didn't do anything for me at all, was Bram's victory over Abyss, thanks to Abyss' Decay stablemate and Bram's apparent lover Rosemary causing a distraction. The duo seemed to tread water waiting for Rosemary's inevitable appearance, going through the motions in a dreary clash. Things weren't helped by the commentary team talking about anything other than the match, despite their being a few weeks of back story heading in. Not a foot was put wrong between "The Monster" and "The Chesterfield Plague" but I don't like enough was done to draw me into the bout. At the conclusion of the scuffle, as Rosemary finally made her appearance, no one seemed to have a clue how they were supposed to be playing the moment. Everyone just looked confused at each other and I looked confused at the television screen. I'd been so into The Decay, but this feud is killing them for me at the moment. Drew Galloway and Ethan Carter III would return from their suspension to beat seven shades of shite into each other, in a superb brawl around ringside and then to the back. There was a real intensity to the action as the two tore strips off each, with Galloway nailing some tasty knife edge chops and a swinging slam situation into the ring-post. It was a believable that the two had an genuine issue, because they both a ferocity to every little interaction they had, making sure each attack looked like it was designed to hurt. I'm really digging this feud at the moment, as it's all about the World Heavyweight Championship, without being for the World Heavyweight Championship. This can only make the belt look like a more worthwhile and precious prize to get your hands on, elevating the status of the strap. A big thumbs up that's been taking steady as well! Another entertaining episode of IMPACT Wrestling, as the show featured good to great moments across it's card. There were a number of highlights for me, with Drew Galloway and Ethan Carter III's brawl being my favourite moment of the show, Matt Hardy continued to excel in his fascinating "Broken" character, Eddie Edwards and Lashley put together a strong main event and there was plenty to enjoy about the X Division ladder match. That's without mentioning the surprise debut of Moose and the return of Davey Richards. There were still problems, like a lack legitimate focus and coherent booking in the X Division, Women and Tag Team ranks. Random multi-man or women bout manage to plug the gap in airtime, but won't keep the fans hooked and show a lack of planning. If you want a Four Way title match, making sure each of the challengers have been built to look like contenders previously. The other major issue was the over reliance on Mike Bennett who took up a hell of a lot of screen-time. I loved Bennett to bits, but being involved in the opener, leading to match in the 2nd half, before being involved in the main event was way too much. 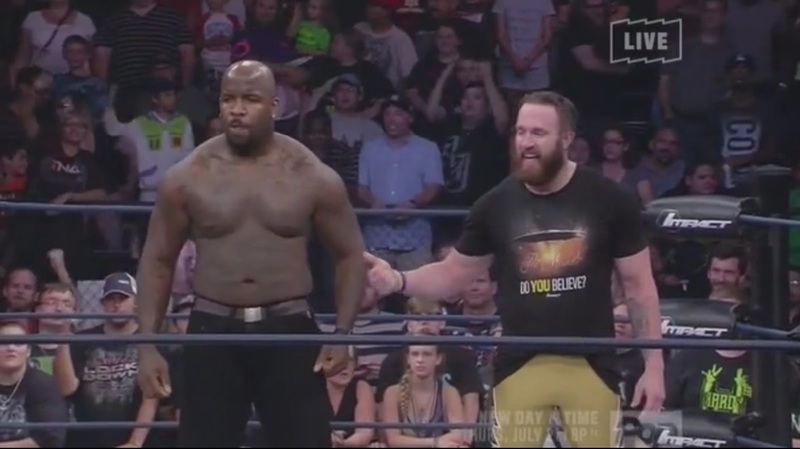 With Dixie Carter announcing a Steel Cage rematch between Lashley and Eddie Edwards next week, and big matches like Galloway v EC3, the beginning of the Bound for Glory Play-Offs and more looming in the future TNA are showing more than a few signs of promise for the rest of the summer!